by artists Claire Brooks, Lesa Farrant, Leonie Westbrook and Jo Wilmot. Last Thursday night our gallery was packed for the opening of Solastalgia, an exhibition of new work by local artists Claire Brooks, Lesa Farrant, Leonie Westbrook and Jo Wilmot. Solastalgia is a word coined by Australian philosopher Glen Albrecht and is used as a term to describe the psychic or existential distress caused by environmental change, such as mining or climate change. The word Solastalgia was formed by combining the Latin word solacium, meaning comfort with the Greek root algia meaning pain. Artists Claire Brooks, Lesa Farrant, Leonie Westbrook and Jo Wilmot have considered man’s impact on the fragile coastal environment and the result is a thoughtful and poetic collection of works in porcelain, steel, brass and beach detritus. The exhibition includes objects, jewellery and film. Lesa Farrant has collected coastal rubbish, man-made and natural and from these has cast and constructed hybrid plant forms in porcelain and you can see the texture of a tennis ball or a hint of a golf tee sprouting from a driftwood stem. Lesa collects from her local beach at Port Willunga and in Solastalgia is exhibiting a suite of soft white porcelain fictional plant specimens. Kelp forests are one of many casualties of global warming and their loss is and will have devastating consequences on the food chain. 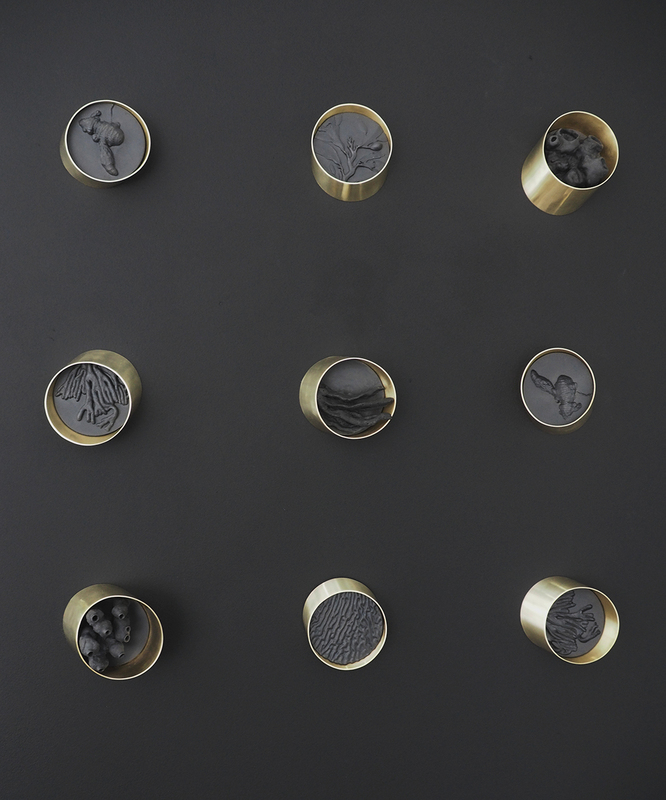 In homage to and recognition of the wonders of kelp Jo Wilmot has cast impressions of sea kelp and algae in black porcelain and set these porcelain dies in polished brass. Along with jewellery and wall pieces Jo has made a video installation titled Last chance to see it is a mesmerizing recording of the gentle dance of the giant kelp. Claire Brooks has been gathering up ‘plastic soup’, those small fragments of plastic tumbled by the ocean currents into deadly confetti which in turn is unwittingly ingested by marine creatures. 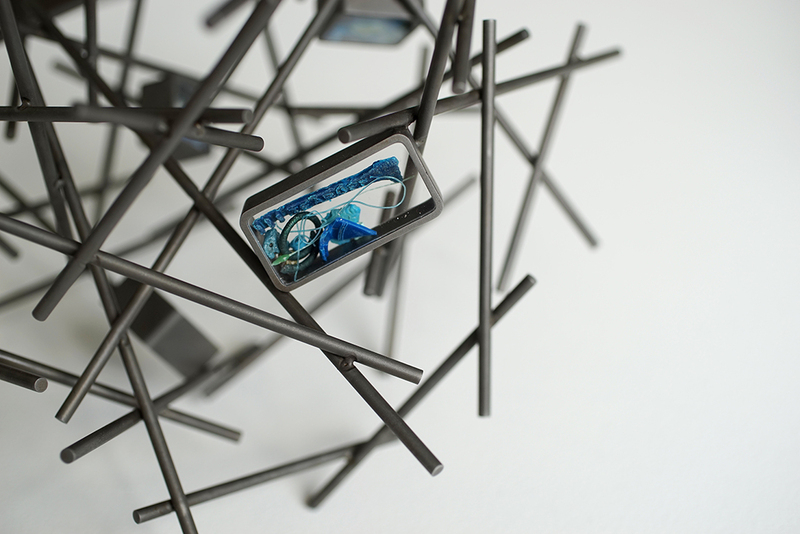 Claire uses the plastic fragments as jeweled highlights dangerously caught in her tangled steel sculptures. Leonie Westbrook was horrified to find out that you could buy ‘beach treasure’ on eBay, artificially made to resemble washed and burnished beach flotsam and jetsam. Thinking about the rubbish that ends up in the ocean and the market for faux beach treasure Leonie embarked on a journey to take ordinary trash and make it desirable through imitating the processes of the ocean. Her starting point was the ‘disposable’ plastic hotel shampoo and conditioner bottles, which Leonie has cut, twisted and tumbled into soft tangled jewellery forms. 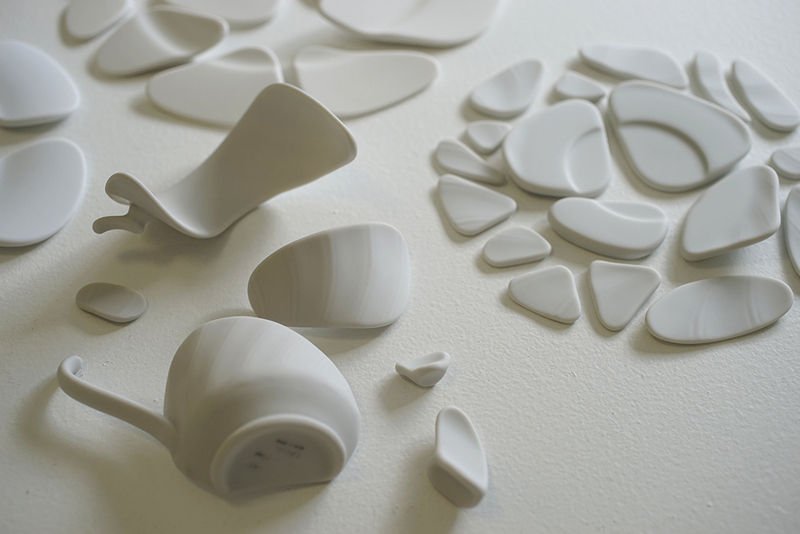 Accompanying the jewellery items is an installation of ceramic shards, a jigsaw of soft forms that hint at a former function. Solastalgia comments on our impact on the environment, our responsibilities and our legacy it is a thoughtful and thought provoking exhibition not to be missed. An interview with the artists can be arranged and good quality images are available.